Over the summer months, Wilfrid Laurier University’s Waterloo campus transforms from a hive of student activity into a community hub, host to children’s camps and international conferences. But one of Laurier’s hidden summer gems can be found just north of University Ave. The Young City Growers' (YCG) micro urban farm, located at the university’s Northdale campus, comes to life May, June, July and August. 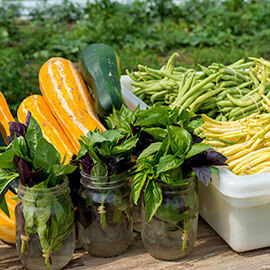 The YCG farm, which began in 2013 with partnership support from Laurier, boasts a summer and fall Community Supported Agriculture (CSA) membership where Laurier students, staff and faculty can access locally produced vegetables right at their doorstep. The CSA program provides members with a weekly bushel or half-bushel of garden vegetables for a set cost. Robbin Williams, a Laurier staff member, has participated in the CSA program for the past three years. She says that having control over her food, eating produce during its natural growing season and knowing that everything is grown locally by community members is what keeps her coming back. The garden also provides a healing space for the community to address social justice and equity issues. Laura Mae Lindo, the director of Laurier’s Diversity and Equity Office, and YCG are investigating how a campus garden can contribute to social justice initiatives and community activism at Laurier and in the broader community. Students can also engage with the garden through course offerings, Community Service Learning (CSL) courses, research programs or as a volunteer or intern. Anne Portoraro, a master’s student in Theology, Spiritual Care and Psychotherapy, found herself working in the garden as part of a CSL course on Spirit and Community. Portoraro, who works as a therapist with people struggling with eating disorders, says that working in the garden inspired her to introduce gardening to her clients to help them redefine their relationship with food. “Through gardening, we begin to see food as more of a basic need and we begin to see the simplicity of it,” said Portoraro. Sarah Fraleigh-Bulckaert, a master’s student in Laurier’s Social Work program, also volunteered in the garden through the Spirit and Community course. Laurier students can volunteer in the garden until the late fall and again in the spring. Volunteers assist with planting, harvesting and cultivating produce while learning about the benefits of urban farming and the importance of sustainable food. Alison Blay-Palmer, an assistant professor in Laurier’s Department of Geography and Environmental Studies and director of the Laurier Centre for Sustainable Food Systems, says that community gardens are one of the best ways to address the challenges we face in the world. “If you think about issues like social inclusion, climate change, physical fitness, healthy eating and citizenship – all these issues are brought together through the community garden,” said Blay-Palmer. And regardless of discipline, Blay-Palmer says that all students, faculty and staff could learn something from the community garden at Laurier. To register for the fall CSA, find details about the YCG paid internship program (April to Oct.) and for other volunteer opportunities, contact Fanis Juma Radstake, YCG Program Manager, at youngcitygrowers@gmail.com. Laurier is also home to the Mino-Kummik community garden on the university’s Waterloo campus and the Indigenous community garden on the Brantford campus.